If you’ve never been to Lefkada, add it to your places to visit, you won’t regret it! The small greek island is known for it’s beautiful beaches and crystal clear waters, this was my second visit to the island and it still took my breath away. To get the cheapest flights we could we flew into Kerkrya on Corfu, and took a ferry to Igoumenitsa on the mainland, from here some friends we stayed with picked us up, handy! You can fly into Preveza, (40 minute drive to Lefkada rather than 1hr 40 from Igoumenitsa) however as we booked our flights late it was incredibly expensive to fly there. Arriving into Corfu airport an amazing sunset set the good vibes for the upcoming ten days, spirits were high! I visited Lefkada with my pal josh and stayed in an apartment complex alongside my good friend Greg and his super cool parents who live out in Lefkada half the year, lucky guys! Rather than stopping in a hotel, this way it feels like we’re living on the island rather than visiting it. We ate in local places, drank in local places and chilled in local known spots. We hired mopeds for a haggled price of €13 a day from a rental place in the nearby town Nidri, the island was ours, we were free to explore and go wherever we pleased. The mopeds took us all over the island, we covered the whole island in a day. South Lefkada to the charming village of Vasiliki for breakfast, a chilling way to start the day. Vasiliki is a small fishing village with a variety of resturants, ice cream parlours and surf shops. On the south west coast of the island is the exotic beach of Egremni, which is known as one of the most beautiful beaches in Greece. Not so accessible due a steep climb of 300+ steps, but it was well worth it. Sadly an earthquake has destroyed this beach since I visited and is no longer accessible. Heading north from Egremni is another great beach known as Kasthisma, this is much more accessible by car/moped and has plenty of parking. It is a popular tourist spot as there are plenty of bars and restaurants by the beach, as well as a few swimming pools. Kathisma is ideal for water sports and paragliding, due to its mountain backdrop location. There’s an option of two paraglide heights, from the top of the road accessing the beach or from the top of the mountain overlooking Kathisma which is much higher! I paid roughly €70 for a mountain take off, this included photos + video too! As well having my own GoPro mounted on my wrist, I got some bangers to show from it. 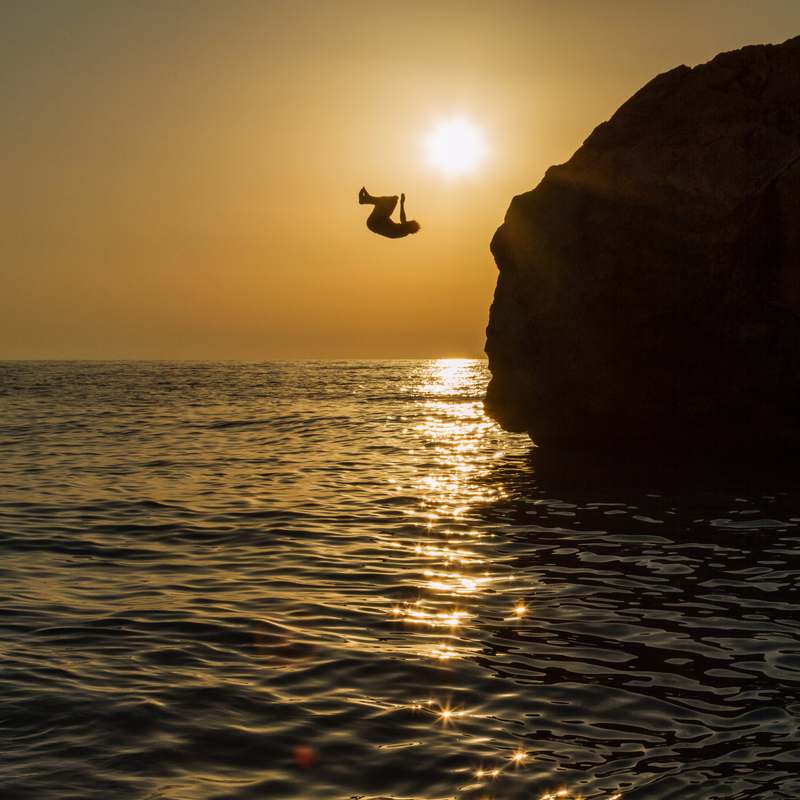 North of Kathisma beach lies some very good jumping rocks! They can be seen in the image above, if sunbathing isn’t your thing, or you have horrid ginger skin like myself then flinging yourself from a 20 foot rock might tickle your pickle. I’ve spent many hours at these rocks between my two Lefkada visits, just can’t get enough! I met a guy called Leo who lives on the island who had a couple of windsurfers, we took them out one day and failed miserably, after countless attempts to stand up I achieved it once, hats off to Leo for his incredible patience. Since I sucked so bad Leo showed who’s boss and give me a tow on the back, so much fun! To wash down all the adrenaline pumping activities every night was spent with a beer in hand. A few nights we travelled into the Lefkada Town, the main town on the island that has clubs and many bars to enjoy. Other nights are spent close by to where we were staying in the likes of Nikiana, and Nidri, both great places to grab a beer, or even a tequila shot at Art Club in Nikiana! We randomly booked ourselves on a ‘White Boat Party’ looking for a bigger buzz, after gathering every piece of white clothing we had we rocked up and it was great! Highly recommended. We booked it in Nidri for the Macedonia Palace boat. One last thing, every fast food restaurant in Greece sells a ‘gyros’, you HAVE to try one. Brilliant! Are you coming over this year? I’d love to! However I’m not sure with the current injury, may of left it too late for cheap flights, I’ll speak to Greg and see what he’s doing.